Yasuteru Urano has developed novel fluorescent probes based on the original idea of intramolecular spirocyclization and precise molecular design principle in live-cell imaging, which is one of the most important technologies in the current biological and medical fields. With these probes, he has achieved innovative and unrivaled results, including demonstrating the dynamics of the formation of skeletal structure in living cells by utilizing super-resolution imaging technology ahead of the rest of the world. It is also noteworthy that dozens of fluorescent probes developed by Dr. Urano have already been marketed at home and abroad, greatly contributing to global biological and medical research. In addition, Dr. Urano, in the belief that chemistry is practical science, has also worked on the development of fluorescent probes that can be used in clinical setting and recently succeeded in developing an epoch-making spray probe technology capable of intraoperative visualization of microcarcinoma, paving the way for practical application. Dr. Urano has developed numerous fluorescent probes from the original viewpoint from basics to applications and has led the way in their practical application. Based on the above considerations, Dr. Urano has been awarded the 17th Yamazaki-Teiichi Prize in Biological Science & Technology. Fluorescence imaging is an indispensable technology to observe events and responses occurring in living cells or living animals in modern biological research. In order to realize this observation technology, it was essential to develop photofunctional molecules called "fluorescent probes" that image molecules to be observed and cellular responses. The success or failure of fluorescence live-cell imaging largely depends on the function of fluorescent probes. Fluorescent probes are roughly divided into those based on fluorescent proteins and those based on organic small molecules, and Urano has consistently carried out development research on the latter, in particular. Precise control of the fluorescence characteristics of a fluorophore is the key to development of organic small-molecule fluorescent probes. However, it is difficult to develop a variety of probes because fluorescence emission is an excited-state phenomenon, and accurate prediction and control are difficult. Urano has conducted research on precise control of fluorophore properties based on original photochemical and organic chemistry ideas. He was the world's first to establish the rational control principle based on photo-induced electron transfer and intramolecular spirocyclization as the operating principle and succeeded in establishing numerous photofunctional molecules that realize the world’s first live-cell imaging and cell function control. 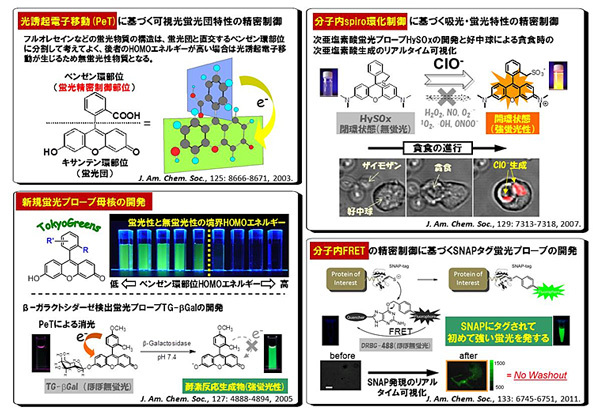 Specifically, he established the world's first precise control method of optical properties of visible-light-excited fluorophores, such as fluorescein, rhodamine, etc., based on photo-induced electron transfer and succeeded in developing various practical fluorescent probes based on a novel fluorophore such as Tokyo Green skeleton (upper left and lower left in Fig. 1). Furthermore, he, for the first time in the world, succeeded in establishing a completely novel molecular design method based on intramolecular spirocyclization control by skillfully utilizing Michael addition reaction and characteristic molecular structure of fluorophores and succeeded in development of a number of fluorescent probes, including the cancer imaging probe described below (upper right in Fig. 1). In addition to this, he succeeded in developing more than 50 novel fluorescent probes, such as a tagged fluorescent probe utilizing intramolecular fluorescence resonance energy transfer (FRET) (lower right in Fig. 1). All fluorescent probes are extremely practical for realizing completely new imaging, and indeed more than 30 kinds of probe products have already been commercialized. Biological researchers around the world have made use of these for many achievements. Urano also succeeded in developing a probe specialized for super-resolution imaging technology, which won the Nobel Prize for Chemistry in 2014 (Fig. 2). 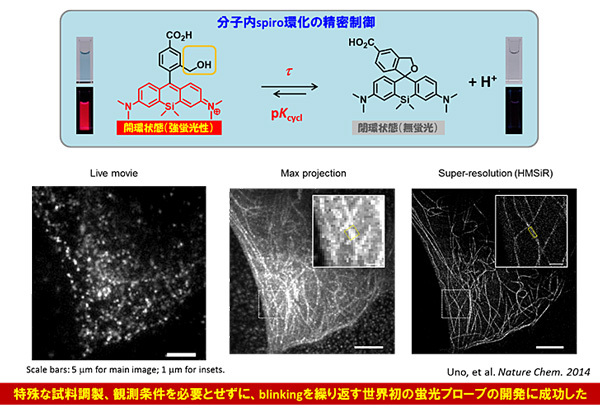 Utilizing this original intramolecular spirocyclization control method, he succeeded in the rational development of the world's first probes that spontaneously repeat blinking in living cells There are distinct from conventional super-resolution imaging probes. The development of these probes makes live super-resolution imaging that was impossible by conventional method possible in many cases, such as live observation of tubulin polymerization and depolymerization at overwhelmingly high resolution compared with the usual confocal image (lower middle in Fig. 2). As a result, this probe was greatly praised both at home and abroad as first-in-class, without equal. In addition, Urano has actively conducted research in recent years in pursuit of the contact point between chemistry and medicine from the belief that "fluorescence imaging chemistry can make a greater contribution as a medical technology that supports the health of the people" and achieved innovative results. A representative example of this is realization of live fluorescence visualization of microcarcinoma by precise design of fluorescent probes. This technology makes precise surgical and endoscopic therapies possible by quick, in situ detection of microcarcinoma in living animals and patients’ bodies. More specifically, Urano succeeded in developing completely novel fluorescent probes that visualize the characteristic enzymatic activity possessed by the cancer site by making full use of his original molecular design technology (top in Fig. 3). He succeeded in fluorescence detection with sufficient visual brightness even for microcarcinoma of 1 mm or less by injecting the probes into the body of a mouse peritoneal disseminated tumor model (middle left in Fig. 3). Furthermore, it was revealed that microcarcinoma can be detected as quickly as about one minute when this probe was endoscopically sprayed on a site suspected of cancer indicating that he succeeded in developing the world's first innovative medical technology (middle right in Fig. 3). In order to refine this spray-type probe to a truly new medical technology, Urano created a clinical fluorescence imaging network including more than 20 domestic and overseas hospitals and conducted studies using fresh clinical specimens derived from actual cancer patients. With this network, it was demonstrated that this technology worked extremely effectively in some types of cancer (bottom in Fig. 3), demonstrating the effective creation of a new, chemistry-based, medical technology. The live-cell imaging technology with fluorescent probes developed by Urano is an epoch-making technology that everyone from basic biologists to clinicians has been eagerly awaiting. In particular, the effectiveness of the technology for intraoperative rapid visualization of microcarcinoma has won widespread backing, and the clinical development is actually launched aiming at marketing as an intraoperative clinical diagnostic drug with investment from many venture capitals such as the University of Tokyo Edge Capital (UTEC) and UMI. In the near future, it is anticipated that this technology will be put into clinical use as a real breakthrough technology, saving the lives of many patients.